For some reason this has been a very hard post to write. It’s a rather strange situation for me as in essence what I’m writing about is really a very basic idea. Maybe it is because I’m afraid that people will misunderstand it or take the wrong message from it. Which if I’m honest means I’m not writing it clearly enough. Oh well! Here goes nothing. That as the impact of digital distribution begins to be felt along the trade publishing value chain, what will emerge is not a NEW VALUE CHAIN as much as a new VALUE WEB, an environment that sees, not one way to generate value in the industry but many ways of doing so. What’s more, this state will persist because no particular method will emerge as the single ‘way’ of trade publishing (if that term even retains relevance), at least not for some time to come. Everyone (at this stage) thinks that the trade publishing value chain is endangered. They’ve even created a word to describe it, disintermediation. And Everyone is right. What I think they tend to ignore is the way in which the value chain is endangered. It’s not a simple change that we are experiencing, it’s far more dramatic and complex then is often imagined. And there’s some real danger of just that happening. You only have to look at how companies like Apple and Amazon have facilitated self-publishing and in so doing excised huge swathes of the old chain from certain sectors of publishing. Certainly on Amazon’s part the ambition to disintermediate the publishing industry has been obvious for some time, at least if you were paying attention, it was certainly clear long before they made this announcement, but sometimes it takes BIG HEADLINES to make people pay attention. And what’s to stop that? After all there is no reason why using Paypal or some other selling tool, an author could conceivably sell ebooks directly to readers and maybe even turn a small trade by doing so. You could argue that Amazon’s Kindle Direct Platform is a close approximates of that, but I think the platform ownership position of that player means its role is greater than just a service provider. Random House has just disintermediated the agent by doing a deal directly with Tom Sharpe for digital rights, and that is by far NOT the only way in which publishers, big and small are finding new ways to operate in the digital era. Bricks and mortar bookstores, despite being at the coal face of the digital wave, are not against a bit of disintermediation themselves. B&N is quietly disintermediating everyone in the self publishing world (just like Amazon is) via Pubit service for their Nook platform. You should expect to see them take their print publishing arm (Sterling) even more seriously then they already do after Amazon’s announcement. Agents are building direct channels to consumers and publishers, long the supposed victims of the piece are beginning to find direct selling attractive and capturing audiences to (hopefully) turn into readers. The point being that as this digital distribution wave of change washes over the industry, it will radically reshape the value chain in unpredictable ways. For some titles it will force authors to make hard decisions, it will reduce the predominance of publishers (or at least the traditional ones) while elevating the role of platform owners like Amazon, B&N, Apple and maybe even Google, but for some titles it will broaden the role of publishers and if they are lucky and smart maybe even the surviving booksellers. Agents may find their 10% under threat too, especially on backlist titles, unless they offer something more valuable then just conversion, after all, their authors are pretty much able to upload a file to a platform for conversion themselves. Authors themselves will face greater competition both from the increased numbers of writers (Good and Bad) facilitated by digital distribution and the existing databases of ALL titles ever published digitized and available for distribution. If most authors already have low incomes, then they will get lower. Though I’d also expect the winners to become even more gigantic! As the influence of bricks & mortar retailers wanes, especially the chains, so too will their ability to demand such high levels of discount. I’m pretty sure the platform owners will be able to squeeze most players for a greater share of the revenue. How powerful they will become remains dependent on just how easy it becomes to read a file you buy one place anywhere (currently easier then I’d have imagined). None of them will go away though. For some books, print will remain a huge segment of the market and bookstores or supermarkets will remain the best place to sell them and traditional publishers will probably remain the best home for such books. For others, the author’s platform will be large enough to justify a going-it-alone route, but even for the biggest authors, for the right book. partnering with an agent, a publisher or a platform owner might be the right move. That’s where the web comes into play. Of course there are going to be losers. The least well positioned players in the game are wholesalers and physical bookstores. Their roles are uniquely challenged because of the shift in format from physical to digital. Yes, as I have said, some print market will persist but what size and shape that will have in twenty years time is anyones guess, what we DO know is that it will be smaller and because of that we’ll have fewer physical bookstores, but how that shakes out we cannot be sure. I’m sure too that we’ll see casualties among the publishing houses that currently thrive. Some because they make bad decisions and fail to adapt and some from just bad luck. Other will lose market share and fall under the wing of other players, maybe they’ll be publishers too, or maybe they’ll be retailers or platform owners. The funny thing about this disintermediation business is that the only clear winners are at the ends of the old chain, writers and readers. The writer’s win is tainted by the knowledge that though their options, the costs of and their routes to publication will have expanded greatly, their chances of earning a living from writing will have decreased rather dramatically too. Readers on the other hand will be faced with a surfeit of choice, less of a problem then most people imagine, but still an issue if too much time is wasted in filtering through those options. On the other hand they can expect to see the price of individual pieces of content to fall, especially when the creator, however talented and however the web has coalesced to deliver that content, is an unknown. Couldn’t agree more, great overview of the situation. More nitty-gritty evidence of how the Internet turns book-industry chains into webs is the BookServer/OPDS project. Essentially, it turns the traditional chains of book-catalogue provision (publisher–distributor–retailer– consumer) into a web, where book acquisition happens from any point in the web directly to any other point (consumer–publisher in an app, publisher–retailer via a web service, etc.). Yes, it is hard to explain, as you say, because it’s such a fundamental shift. Where was I … ah yes … the key was at the end. The two important cornerstones of the whole business are the WRITER and the READER. One produces all of the content. The other consumes it. Once that is clear the rest follows. Before digital, the WRITER had one route to the READER. It was through an AGENT, who then hooked him up with a PUBLISHER, who then printed and distributed the books through WHOLESALER and RETAILER. Each player took a percentage. Books were expensive. Writers were left with the runt of the profit margin. In the new paradigm, as you say, the WRITER will chose from a selection of routes to reach the READER. He will be able to choose to go directly to the reader via online stores like Amazon and B&N and other Indie stores, as more and more writers are doing and in my view this group will represent a significant chunk of future writers. Alternatively he will be able to choose from a selection of PRODUCERS to act on his behalf, offering editing, coaching, marketing, IT and design skills. In the past WRITERS signed up all of their creativity on a blanket basis to a publisher. This is a highly inefficient way of doing business for any publisher imho. It is also a crazy loss of freedom by an author. In future I am certain writers and producers will negotiate title by title contracts and royalties etc will vary according to each title. For the publishing industry the question I guess is who will be these PRODUCERS ? The big publishers are heavy with locked in infrastructure, middle management, systems and mind sets. Can they restructure fast enough while still carrying on their existing paper commitments ? From what I read, many of them have been extraordinarily slow to adapt and show little signs of positioning themselves in the long term. I believe that the smart thing they should be doing is splitting their business structures and systems into two streams surrounding common services like editing services etc. This way they can insulate each from the other intellectually, with completely different mindsets dealing with what they know best. The most exciting thing is that the number of writers will significantly increase. This will enable the public to enjoy the creativity of writers who fell foul of subjective, narrow minded publishers and agents who blocked them in the past. That this will also result in some increase in below par titles is inevitable. But I believe that the gate keepering of agents and publishers in the past has not in fact kept quality high at all. It has simply enacted a superficial and subjective blockage that resulted in it’s own flow of utter bilge reaching the book shelves. I also don’t share your negative vista for writer’s earnings. I believe reading will expand significantly. Royalty percentages will increase and are already doing so. I see a golden future for the bulk of writers who have any solid talent. The real question for future and backlist AUTHORS will be who can add value to their product. Dusty and monocled old-style publishers, small nimble publishers or newly formed Producers formed by the coming together of quality editors, marketers and IT specialists who can offer multiple choice services to authors who can choose from a suite of services depending on their own skill sets and lifestyle goals. I know where I would go. The big losers will be big slow moving Publishers, Agents, Bookshops and Wholesalers. In countries like the USA and UK, I cannot see any future for large bookshops starting now ! and if I were an investor or owner I would be heavily into strategising an exit from this business right now. Small shops may survive off the high street with POD at their core. Other countries may get another three years or so. Yup I agree with most of that. Except two important parts. 1) Expanded reading. I am much less positive about that. No evidence to suggest digital will increase reading of long form text. In fact as digital enables the wider distribution of many more forms of possible entertainment and information, I fear that reading will suffer from competition. 2) Writers earnings. Yes royalty rates will rise. BUT prices will fall. The slice per unit will be, although in % terms bigger, in real numbers smaller. That’s assuming you break through the noise of all those new writers to gain some modest level of sales, which will be harder. There will be bookshops, but they will sell, new books, old books, pod books, deep backlist and provide lots of services and events f they are to survive. On writers earnings: they’ll stay the same. Not because royalties, pricing and volume will balance magically, but because the industry and its reading public dictates that, averaged out, writers earn less than they need to live on. Which is to say, writers will always have either day jobs or unpaid bills. Why? Because they’re almost all willing to write for a pittance. They always have been, for thousands of years. Writing is art, and society will only allow a few selected heroes of that art’s most populist genres to make an actual living, or, god forbid, become rich from it. Royalty rates, pricing, volume, buying patterns, publisher/investor risk aversion, curation, libraries, education, taste, movie tie-ins – these factors and many others will conspire as they always have to keep writers earning exactly what society expects them to earn. Not much, but enough to keep us in stories. I think the fact is that often writers don’t earn anything because their books don’t sell and aren’t read by very many people. That’s just a reality. When serious numbers of people start reading your books, you do okay and when very large numbers start reading then you do well. As the industry changes that won’t, though the exact % of the sale you get will go up and I believe the cost per unit sold down (except maybe for paper books, but that’s another issue or for HUGE writers but they’ll be outliers) for all of that though, the result is the same. Maybe this post was hard to write because it is so good. I think there are real problems for both readers and writers in coping with the sheer volume of titles. How do you find what you want? How do you get your work to the people who might be interested? But then, that has ALWAYS been true (So many books, so little time). I think a self-published author (that’s me) has to figure on a minimum of a year of marketing. Well Lindsay, that’s terribly nice of you to say! The filter/connection issue is definitely a big issue for sure. Bigger for authors then readers I suspect because the author loses more when they miss a possible sale, the reader probably gets a good alternative and often will never know they missed the prize! As for how much marketing you need to be doing, a year sounds good, but constant, endless slogging, blogging and profile building and engagement that isn’t too sales-y sounds more like it, upon which, if you are lucky, there is a base for building! Eoin – one thing that I believe will affect the distribution profile of earnings among writers will be the influence of how eBooks will be chosen. In the past the Agents and Publishers acted as gate keepers, allowing a select group of writers and titles through to print. They also cherry picked a second sub group of select titles for their big marketing money, and then only a limited number of titles could fit on shelves. This resulted in the huge earnings for the very few and small earnings for the majority. What affect will the new way of finding eBooks have ? no shelf limits ? no one knows I guess. The effect of the current style social reading sites ? of the next wave of recommendation and social reading sites and the recommend and comment systems that Amazon and others use. I suspect all of these will change the profile of earnings distribution. I agree Howard, my feeling is it will lead to even LARGER disparities between the successful authors and those who are not a successful, when success is measured by sales/downloads/royalties! That’s marketing for the self-published! You really cannot recommend your own book and expect anyone to take you seriously. I’m rather afraid that’s the case! Very interesting post, Mr Purcell. I just have a little question : are you sure both extremities of the scheme (author / reader) will not become closer than it appears here ? Isn’t it the nature of the web to take down the wall between writing and reading ? What about social reading (ala Bob Stein) and social publishing (ala Red Lemonade) ? In social reading, readers create one more layer on the work of the author. In social publishing, authors and readers both read and write, and publisher shares the curation task with the community of authors/readers. In the first case, readers become authors after the book of one author is published, in the second case, readers and authors are interacting, each member of the community playing both roles, before the publication. I think that’s one possible outcome and goes towards the idea of the web of value in lots of ways. The role of the publishers/platform provider there extracting value is something I’d highlight. They might strt as an organic community led publisher, but I suspect over time they’d need to develop some form of corporate hub to ensure survival. Personally, and I stress that this is a personal feeling, I’m not yet convinced that social-reading is as large a part of the future as others seem to think. Except for a very peripheral interest in sharing bits they like (though not so much with reading the bits others have shared), most readers still enjoy reading (either print or digital) as a singular experience. Maybe that will shift over time, but I remain a bit wary of it. Full agreement about the idea that we quickly shift from a publishing *** chain to a publishing *** web (I usually say ‘graph’) — other people might phrase it as ‘transmedia publishing’ or ‘production’. Imo, the issue needs to be (more) focussed on what we mean when using the term ‘value’: value for ‘Content [horresco referens] industries’, ‘authors (& heirs) rente [with an ‘e’]’, social value? The issue is about how to help creators cope with the impact of skills acquiring, with their living requirements, with technical needs for creation and dissemination, NOT about getting rich enough so that some investors, the creator and his heirs can live an easy living for an odd 70 years. I think that question of value is critical and in this post I agree, while I’ve not defined it, I think I’ve most let it be assumed I mean MONEY. For all of that the value chain for most ‘values’ of value is also shifting. For instance self publishing digitally is now seen as an almost GOOD thing to do a shift that has happened in less then a year. Quite dramatic. But even more, the cost of self publishing which used to be so high that we called it vanity publishing is collapsing as sites like KDP and Smashwords make it free! What’s more, the value of a mainstream print media critical review is actually increasing in kudos terms while decreasing in monetary terms as increasingly those venues are seen not to drive sales, while the value of some blog site reviews are increasing in both senses. So the ‘value’ we mean may change but I suspect the same degree of flux is still occurring. PS: I hesitate to describe anything as transmedia. I am deeply skeptical of all things that try and unnaturally mash video, audio and text together as a ‘new form of book’ and pretend it’s anything other than a fancy website (which is not a bad thing in my view, but why hide it?). In my view, transmedia covers as well ‘multimedia’ works such as mash-ups, as multi-channel talent dissemination. Thanks for the comment! Love Konrath’s blog alright! Not sure I agree with him always! On the active book, it’s just a fancy website! Seriously, and not even that fancy! Why do we always feel the need to reinvent something that aready exists and works well? I know what you mean Eoin. I know Joe very well – met him at the Love is Murder conference in Chicago in 2005. He has had major success with his ebooks last year – literally, he’s made a ton of money, earnings he’d never have attained with what he calls a ‘legacy publisher’. And why not? One doesn’t have to starve or live in penury to maintain the purity of the vocation. I own a Kindle and I absolutely love it. I still read books printed on paper but I’m buying and reading a lot more on my Kindle. I am dipping my own toes in the water and I’ve put some of my stuff on Kindle. As regards Joe’s Active ebook concept – he’s certainly thinking outside of the box. Personally I don’t think that I’d want to start an interactive experience with my readers in the way he suggests. But people said only a couple of years ago that ebooks would never catch on. How wrong was that point of view? I’ve never been an opponent of digital books, though I believe that instead of creating some half-way house we’d be better shifting entirely to the web and using its advantages (much as Joe envisions in his piece) to build communities around niches of interest. Good for Joe, I admire him. And good for all those who follow his lead and do well. That said, I fear the digital world will not necessarily be the money rich environment some authors think. I suspect much of the actual cash will accrue to the winners, rather then spreading in some democratic way! Eoin, why exactly do you think that the money will gravitate so extremely to the few ? Ah .. ok I thought you might have some technical insider publisher mechanistic reason 🙂 but a gut feeling is fine .. I believe a wide and eclectic range of specialist, and innovative eRetailing eBook sites will develop in the coming years. Some will actually sell direct but others will sell via the Amazon affiliate program. I believe that after a couple of years, readers won’t want to trawl through mega sites like Amazon to find their reads. It is just too vast and unfriendly. They will hook up with a range of their chosen specialist sites on the one hand, and social reading networks with recommendation/referral networks built into eReading apps on the other. The reason behind the extreme imbalance in the print industry was the self selection of best sellers by the publishers, and the limitation on shelf space. Readers were continuously ‘funnelled’ to the best sellers. Mid range titles were marginalised and then out of print. Readers couldn’t buy them because they were not there to buy. Quality was irrelevant. Readers could not buy what they could not see. With digital, there is no self selection of bestsellers by publishers any more. There is also no limit in shelf space or shelf life. There is also a burgeoning, good quality, self publishing sector. I believe eReader referral networks, mixed with specialist review web sites, will enable readers to follow their preferred styles and then branch out, following referrals, with a very high level of efficiency, and minimum trawling of huge databases like Amazon, across a wide range of eRetailing sites. This imho is the reason why digital will spread out the sales far more than the print model. While saying that it is obvious and self evident that there will always be best sellers and there will also be non sellers. All the factors you discuss, on the web, lead to fat heads, long tails. First it’ll happen in the niches, with a filter effect that pushes highlighted books to the top of those niches pushing revenue towards those books. Then as those books cross genres or go mainstream the same effect will be repeated and revenue gets pushed towards the winners. There will be revenue for other titles, but it will be spread across SO many that the average revenue per author will be lower then it even is now. It doesn’t matter if this happens at niche of amazon level, it’s still gonna happen! Good piece on a necessary discussion about the value web, digital distribution and distermediation, thanks! It is a smart assumption, that there are publishing “institutions” with new roles in value web rather than a value chain, like publishers, agents, retailers, even booksellers. But I fear, your piece is just the beginning of quite a lot more posts to come (and that you will have to write ;-). Because, if you are correct in what you are saying – no doubt -, then it will be necessary to have a much closer look at the new tasks of these actors and their new positioned, different roles in this heterogenic, non-linear environment, you have in mind. Amazon will need to learn how to act as a publisher. This will not be that easy, even for Amazon. Being good at one thing does not necessarily mean, being good a other/all things. Agents might know how to send files (and books) to Amazon. Just like self-publishing that will do in a market, where Amazon has 60% plus. But will they be able to act as publishers, aggregators or distributors in markets that are more complex? Publishers might be willing to get closer to their readers, to know them better and get into a direct relationship with them, but can they easily abandon retailers, wholesalers, bookstores as long as they depend on sales of printbooks? Direct sales to readers currently are non-existing for printbooks and ebooks for reasons, at least in the dimensions trade publishers need to calculate. 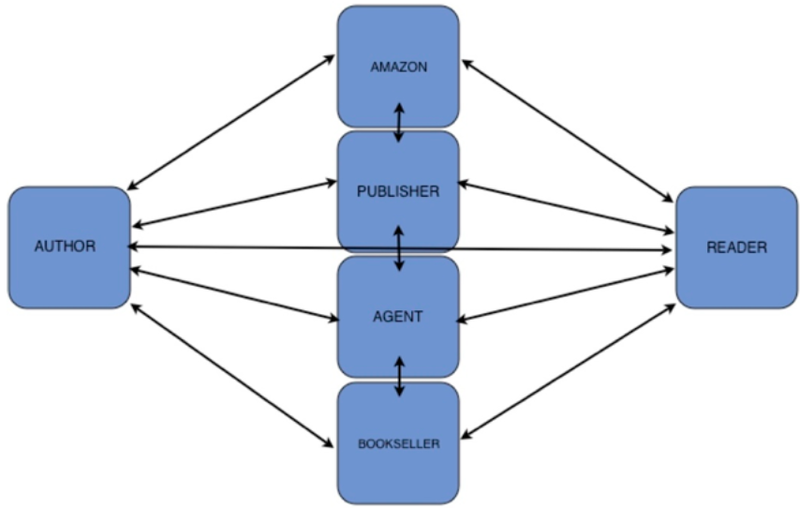 When Amazon or agents or bookstores become publishers, they will become publishers. Maybe publishers with less overhead, less obligations, less interweaving, and with certain advantages: Some might have direct relationships to authors, others to readers. But still publishers. Having in mind things like daily operations, logistics, software, tools, staff, experience, which equal costs, I doubt, that it will be that easy to shift, change and adapt new tasks and find a position in that value web without ending up becoming what initially was competed. I think this may have been “said” but lost in other thoughts: the reason that writers’ incomes will go down — even IF reading (i.e. demand) rises — is that the number of books available (i.e. supply) will certainly rise even faster. The core of Richard Nash’s Cursor argument is that there are gazillions of people who want to be authors and that the web removes the barriers that prevent them from being published, or made widely available. On that point, I think Richard is bang on target. If supply grows faster than demand, prices fall, as you said. But the corollary is that many more books are dividing about the same number of dollars (or euros or pounds), and that, ipso facto, means less money for each one. Agreed re; the economics. Though that spread is hardly gonna be equal is my thinking, meaning even more uneven distribution of the revenue there is, thus bigger big ones. One aspect I haven’t considered though is the impact of increased self-publishing and the increased capture of value by authors as that sector grows. If we say that traditionally the author captured between 10-20% of the value but in a more digital environment, even one where multiple publishing options exist side by side, they capture say 40-70% of the value, even with static “industry” revenue the author* share of that revenue grows markedly but again, I suspect that will accumulate at the top rather than trickle down! *I sue that to mean the sum of all authors’ share of revenue! This time around, Kindle Singles have published one of the stories, “The Other Fella” in digital form only, which can be downloaded to your Kindle or, with the right app, to the iPhone, iPad, Nook, Blackberry, etc. It’s an effort on my part to begin marketing the book itself, which will be published in print and digital form later this year. The current storm of change in publishing fascinates me, and I’m doing this in order to explore whether my own marketing and the new ways of going about it can significantly alter the ways in which my books can be brought before the public.